Origin and Habitat: Santa Victoria to Quebrada del Toro, Salta, Argentina. 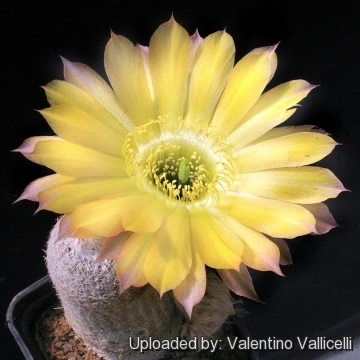 Description: Echinopsis densispina f. albolanata (Lobivia albolanata) is a solitary or slowly branching white woolly form of Echinopsis densispina. 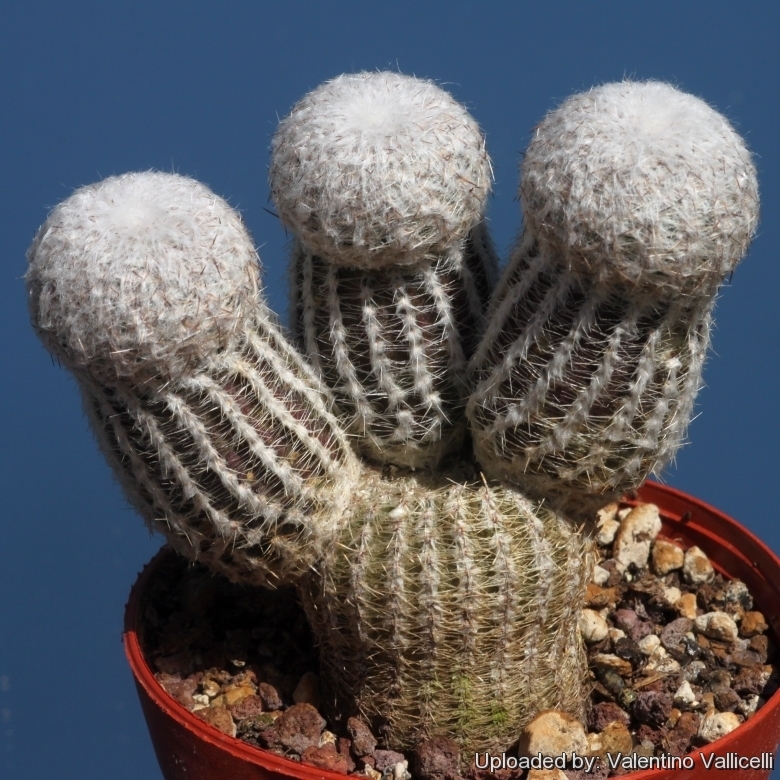 However the distinguishing soft white spines of Echinopsis densispina f. albolanata, appear to fall within the natural variation of Echinopsis densispina and it should be synonymized with the latter. Stem: 3-6 cm in diameter, 4-10 cm tall, short columnar, somewhat woolly, especially near the crown of the plant. Epidermis glaucous-green to dark purplish red coloured in full sun. Ribs: Not very prominent, vertical and shortly tuberculated. Radial spines: 12-20 or more, short up to 1 cm (usually less) very fine, flexible, whitish and almost pectinated. Central spines: Usually absent, but occasionally 1 or 2 stronger and darker. Flowers: Golden yellow. It's supposed to be free flowering but plant start flowering only when 4-5 years old. 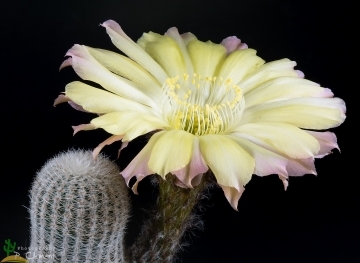 Echinopsis densispina Werderm. : Solitary or in clusters from a large tap root. The stem is dull green or brown-purplish-green, the spines are quite variable in form, length and number, forming a close network that shades and in many cases almost hides the body. 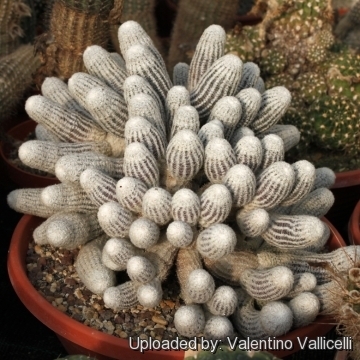 Echinopsis densispina f. albolanata cristata: Striking crested cactus that will soon form a white brain-like mound. Echinopsis densispina f. albolanata (Buining) Buining: This is the white woolly form of Lobivia densispina It has approx 12-20 radial spines, short up to 1 cm (but usually less) very fine, flexible, whitish and almost pectinated. Central spines usually absent. 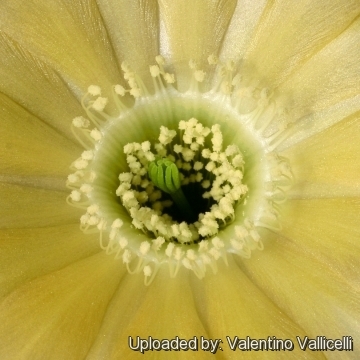 Echinopsis densispina f. aurantiaca (Wessner) Buining: has yellow or orngish flowers and tight pectinate spines, all radials. Echinopsis densispina f. cristata "mauve type": Crested form with very dark mauve stems and tiny spines that forms a dense coating. 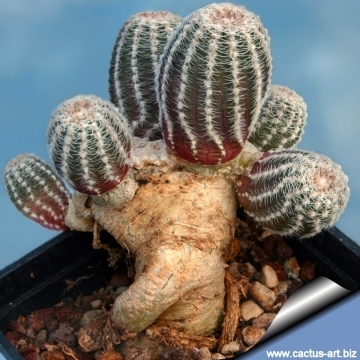 Echinopsis densispina f. cristata: Dark green to red-purple ribs with flat tubercles between which the areoles appear. 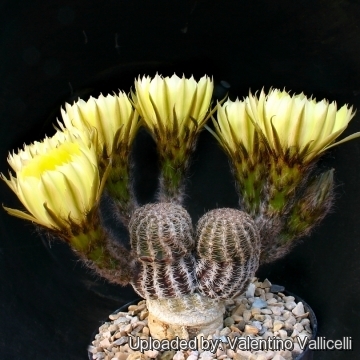 Echinopsis densispina var. pectinifera (Wessner) J.G.Lamb. : has short pectinated spines. Distribution: Tilcara, Jujuy, Argentina. Echinopsis densispina f. sublimiflora (Backeb. ex Wessner) Buining: has diaphanous, pectinate spines, central spine blacker and pointing upwards. The beautiful flowers are very large for the size of plant, lustrous salmon-pink to carmine in colour. 6) Lowry, M. 2013. 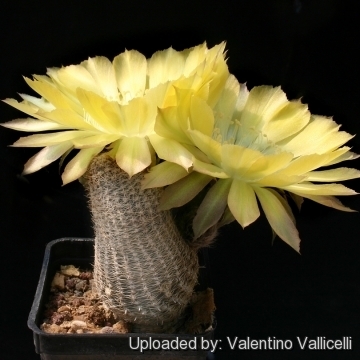 Echinopsis densispina. In: IUCN 2013. "IUCN Red List of Threatened Species." Version 2013.2. <www.iucnredlist.org>. Downloaded on 01 January 2014. Cultivation and Propagation: It is a summer grower species that offers no cultivation difficulties. 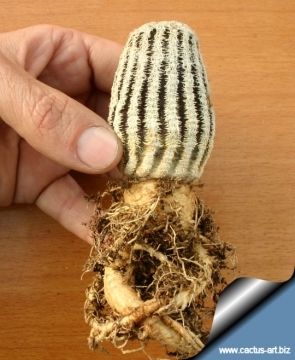 Lobivia albolanata has a fairly large tap root, and should be kept in a deep pot with a very draining mineral substrate. Water regularly in summer (but do not overwater ) keep dry in winter. Feed with a high potassium fertilizer in summer. Repot yearly until reaching about 100 mm in size, then every two or three years will suffice. Repotting is best done at the end of winter but can be done at other times. Do not water for a couple of weeks after repotting to reduce risk of root rot via broken roots. Repotting will increase size of stems. It is quite cold tolerant if kept dry (hardy to -5° C). Need a bright exposure, full sun or half shade in summer.